"Due to a new administration instruction as part of the implementation of chapter 11 (2) Employment Ordinance, the application must be rejected. Therefore buffet restaurants with a general Asian flavor are not specialty restaurants. " In addition, the Federal Agency then refers to specific circumstances that would exist in the affected Chinese restaurant. As a result, the approvals for Chinese restaurants are rejected, offering a buffet concept with the following features: Mongolian Barbecue, All-you-can-eat, Teppanyaki, Sushi, preparation of raw ingredients that are cooked on a hot plate and should not require any knowledge of Chinese cuisine, offering Japanese, Indonesian or Thai cuisine. In one of Sangong law firm cases’, a client running a large Chinese buffet restaurant was denied from hiring a specialty chef because he offered dumplings and the department of the Federal Employment Agency obviously had no idea that it is a thousand-year-old traditional Chinese food. Sangong law firm has internal documents and a statement of the Federal Employment Agency, which makes it seem doubtful that a new administration instruction to interpret chapter 11 paragraph 2 actually exists. Even if such a new administration instruction even exists, Sangong law firm believes that it violates the law. In that regard, it is assumed that the "old" administration instruction is still effective. Recently, the Administration Court of Freiburg followed Sangong law firm’s opinion in its decision from the first of October 2018 4171/18 and conducted. Other criteria for a qualification as a specialty restaurant are… the product palette, which must correspond to the respective national kitchen and has to consist at least with 90%of country-specific specialties. " Sangong law firm is currently receiving numerous phone calls from worry restaurant owners across Germany, who have been affected by rejections by the Federal Employment Agency and worry about their existence. If you have any questions and in need of support, contact our law firm. In this case we will assist you with our knowledge and experiences and enforce your rights. This text is available in English and Chinese. Simply call up the news section in the respective language. Sangong law firm advises and is committed to the Chinese gastronomy in Germany already for several years and is therefore familiar with the challenges, restaurant owners are faced with in their daily work. It has been some time now that Sangong law firm discovered applications and as well extensions for residence permits for Chinese specialty cooks become increasingly more difficult to obtain. It is because the responsible department located at the Federal Employment Agency rejects its approval towards the relevant immigration authorities or foreign authorities in a high number of cases due to the fact that it does not recognize the conditions of a specialty restaurant to be fulfilled by law. The Federal Employment Agency points to a new administration instruction (“Weisungslage”) in many cases. According to that new administration instruction, buffet restaurants with a general Asian style may not to be considered specialty restaurants any more. This affects also Chinese restaurants which do not only offer Chinese cuisine but also Vietnamese, Thai and/or other Asian cuisines. Thus, the Federal Employment Agency turns against its previous administration instructions to which the focus of the offered meals was crucial to confirm a restaurant to be a Chinese specialty restaurant or not. Actually, a new administration instruction, although several times announced by the Federal Employment Agency, has not been published so far (status September 2018). Further, such a new administration instruction should not match with the appropriate law (Beschäftigungsverordnung / Employment Ordinance), which enjoys higher priority than the administration instruction. It is important for a gastronomic company to be qualified as a specialty restaurant by law, that it is indeed a restaurant in the classical meaning. Thus, a place where dishes are served and in which the customer in general is able to rest for a while. But in addition, rather higher requirements have to be made to run a specialty restaurant than an ordinary restaurant. The administrative court of Munich justifies this with the necessity of the specialty restaurant having a specific need for foreign specialty cooks. By this the administrative court explains that the selection of offered foods need preparation by a foreign cook, who is not easy to find in the German labor market. Besides the selection of offered foods, the conditions of the premises and its design are important for a specialty restaurant to be qualified as a such. For Chinese gastronomy in Germany it is already very difficult, to find specialty cooks in China, who are willing to work up to four years abroad. The current situation is causing the already tense situation of Chinese gastronomy in Germany to become even more acute. The acute shortage of staff has already reached existential impacts in many cases for restaurant owners. Sangong law firm recommends owners of Chinese restaurants to not accept rejections of the Federal Employment Agency’s responsible department just like that. There are legal ways, which can as well be enforced by court if necessary, to get an official confirmation as a specialty restaurant by the Federal Employment Agency, so that a gastronomic company will be accepted as a proper workplace for a Chinese cook. It is important during the application or extension procedure for a residence permit of a Chinese specialty cook to accompany the procedure from a very early stage by a law firm which has knowledge and years of experience in this area. Legal support is even more important in cases, in which already a rejection took place. Sangong law firm is legal partner of the Chinese gastronomy in Germany for many years. The specialization of Sangong law firm associated with an extraordinary engagement, deep knowledge of the relevant legal regulations and years of experience is an extraordinary benefit for its clients. It is an essential element of Sangong law firm’s conviction, that our business clients are able to solely focus on the management of their company, while we take care of a comprehensive enforcement of our clients’ interests. 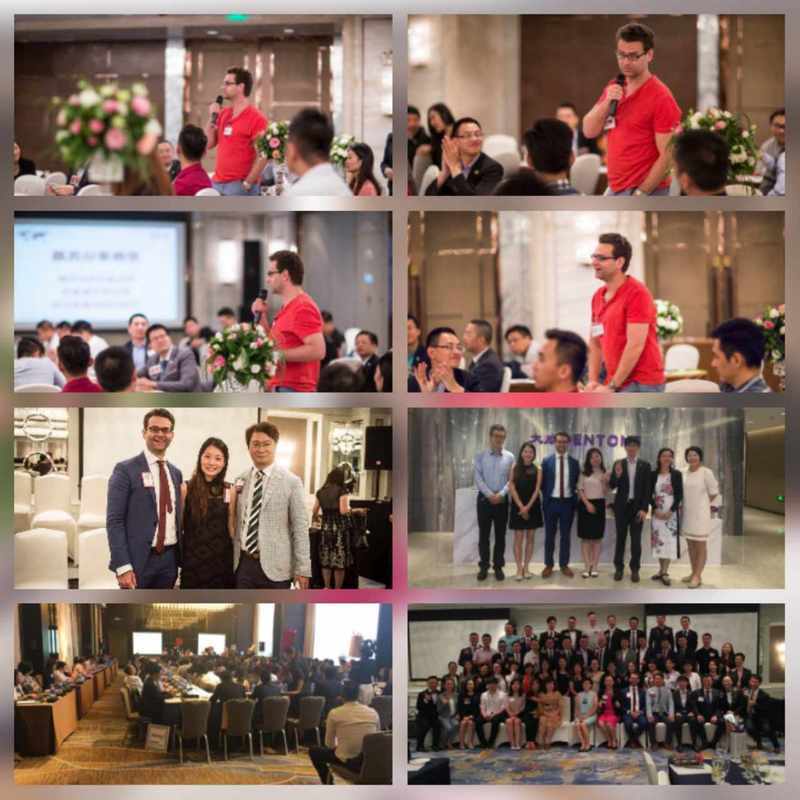 While visiting Sangong law firm's long-term clients in China, Sangong lawyer Malte Barsch and his colleague Missyco Chong took the chance to attend a couple of very interesting entrepreneur meetings to give an introduction of Sangong’s scope of services in mandarin to Chinese entrepreneurs and to reply some questions about German migration and business law. Mr. Barsch and Mrs. Chong were glad to meet Sangong’s clients face to face and beside got to know a lot of great people and companies. The residence permit as a company specialist is largely unknown, but it is an interesting alternative to employ foreign workers in Germany. According to the law a company specialist is, who has a special expertise, which is essential for the services, researches, processes, technology or management of a company. This requires not only, that the person has a so-called company-specific expertise, but above that has special knowledge. The person must therefore be able to demonstrate a high qualification with regard to a particular activity. In which cases is an application useful? Due to high ground effort, an application makes sense only if there is no alternative residence title applicable. Alternative residence permits are those in which, due to the nature of the residence permit, the approval of the Federal Employment Agency is not required or limited (managerial activity, Blue Card EU). Wages are above branch level. This level is, however, different from region to region. Employment of specialists, who do not exercise shortage occupation. The employee’s remuneration is usually more favorable than in cases where a person is to be employed as part of a Blue Card EU or as a senior executive. The favored workforces have an increased company-specific expertise, which can directly contribute to the company and thus increase the competitiveness and growth of the company. Sangong law firm has an excellent knowledge of the laws and regulations applicable to the application. Due to its experience, Sangong law firm is able to carry out the application process effectively and without loss of time. The companies supervised by Sangong law firm are therefore able to deploy the coveted workforce in a relatively short time. Sangong law firm advises gastronomic companies all over Germany. A focus here is set on the Chinese cuisine oriented restaurants. The Chinese specialty cook plays a special role in legal advice, which requires particularly demanding service. Sangong law firm assists you in applying for the appropriate residence permit at the German embassies and immigration authorities and takes over the complete communication. Recently, we are increasingly addressing the concerns of our clients who are looking for further employment in Germany. Chinese specialty cooks are only allowed to work in Germany for a period of four years based on an agreement between the People's Republic of China and the Federal Republic of Germany. An extension on a regular basis is not possible. However, it is reserved for the Chinese specialty cook to apply again to the German foreign authorities after a period of four years to return to Germany for the same period and to work as a cook here. Extensions respectively new applications, which lead to the fact that the specialty cook can stay in Germany for long term, are regularly dealt as suspicious by the immigration authorities, which often suspect these cases as covered regular (former) employment. Undoubtedly, these cases certainly exist. Nevertheless, the position of the specialty cook has greatly changed in recent years. The work force of a Chinese cook is now much more appreciated than few years ago. The salary level in China has now risen to such an extent, that it is no longer attractive to work abroad and be separated from the family, even with a higher salary. Cooks, who nevertheless come to work in Germany, encounter a higher appreciation in the business. In addition to their actual activities, they also take on important management tasks in the company. Moreover, many descendants of Chinese restaurants owners do not want to take over the parents' businesses, because of other interests aroused by school and study. At the same time, however, the owners of these restaurants are getting older and increasingly rely on specialty cooks to manage their businesses. Against this background, many restaurant owners understandably are keen to continue their cooks’ work as a manager. Sangong law firm is responsible for several of these cases, of which some of them have been already successfully closed. In some cases, it is not easy to eliminate the official’s assumption, that the specialty cook is now to be employed as a senior employee (manager). Unfortunately, this attitude does have an effect to the administrative procedure. At the same time, the authorities overlook the fact that they must create a neutral procedure for the applicant and that they as well must take account of the circumstances favorable to the parties involved. It happens in some cases as well, that this negative attitude of the officials is also taken over by judges in judicial proceedings. A particularly regrettable decision by an administrative court, in which Sangong law firm was not involved, concluded that the loss of more than 15 jobs, and thus the closure of the business, should be acceptable than granting a new residence permit to the cook to work as senior employee (manager). To avoid this, you should have your interests and those of your employees represented right from the start by Sangong law firm. ​This text is available in German and Chinese. Just go to the News section in your preferred language. ​Figures for applications of and decisions on Schengen Visas are registered quite well by the European Commission. In 2015 a total of 2,022,870 Schengen Visas were worldwide filed at the German embassies and consulates. Of these, 1,872,322 applications were positively granted, while a number 150,618 applications have been refused. This results in a rejection rate of about 7.4%. At the German Embassy and consulates in China a total of 362,132 applications were submitted for a Schengen Visa, 349,326 applications were granted positive and 12,806 applications rejected. This results in a rejection rate of about 3.7%. In the previous year 2014, the rejection rate in China was 4.3% at 316,197 applications, of which 13,666 applications were rejected. It would be misleading to draw conclusions due to the presented numbers that applications for visas always have a great chance of success. For in fact, only the figures for Schengen Visas were considered. These allow only a stay of 90 days within 180 days and therefore no long-term stay. Legal basis for issuing is the Schengen Borders Code, a EU regulation, which displaces the national regulations in many parts. However, it is more exciting to look at the figures for applying for and issuing of National Visa (“D Visa”). These are such visas that are granted for a longer than 90 days continuous stay. The National Visa is a requirement for a residence permit for the purpose of self-employment, work, study, spouse or family reunion, etc. The Federal Foreign Office announces on its website that a total of 207,894 National Visas were issued in 2014 and a total of 177,703 National Visas have been positively decided in the previous year 2013. It would be interesting, however, to know how many National visa applications have been denied. This was among others the subject of a request to the federal government in 2015. The federal government replied (Drucksache 18/4765), that in 2014 a number of 20,575 applications have been filed for a National Visa in China. Of these, 1,038 applications were rejected and 186 applications were withdrawn. This results in a rejection rate of 4.76%. At first glance this sounds positive. Unfortunately, the federal government provides no information on the issue of the National Visa underlying purposes (studies, spouses, work, etc.). For instance, a spouse- or family reunification regularly turns out to have easier success than the entry for the purpose of becoming self-employed or employed. Also, and this is regrettable, does not follow from the figures shown, the period during which the respective National Visa applications were completed by the diplomatic services. If it is intended to settle down long time in Germany, it is highly advisable to access professional support. Sangong law firm can help you in successfully applying for a visa. We are a company specializing in Chinese clients. Our advice is therefore provided in Chinese language. This allows us to prevent the risk of linguistic misunderstandings and promote the success of our clients. Through this, we also provide our clients best care in their concerns. On March 13, 2016 Apple Inc. lost against the Xinting Tiandi Science and Technology (Beijing) Co., Ltd. (XTST) in the Chinese courts of last instance. The courts confirm, that Apple Inc. has no exclusive right on the brand “iPhone”. That means, that XTST is allowed to sell leather products and leather like products, for example wallets, handbags, phone pockets, etc. under the name “iPhone”. The judgment is controversially discussed. Apple Inc. refrained to register the brand “iPhone” in time, so that XTST first registered the brand in 2007. Apple Inc. object to the registration in 2010, but complained two years later and therefore five years after the registration. Apple Inc. could have avoided the defeat in court, if it registered the brand in China timely and followed up the violations immediately and efficiently. In the intended market of products, which is based on a branched manufacturing process, but also in simple cases, which have or should have a transnational dimension, the founder should take special care of the protection of its rights. Unfortunately this is disregarded in many cases for whatever reasons. Therefore, a knowledgeable lawyer can point out the risks and deliver appropriate solution strategies. Is the residence permit for job search of qualified workforce a success or is it rather unknown? This question should be raised, especially due to the fact that the provision regulating the application was limited to 1 August 2016 and applications can only submitted until then. The government determined with the deletion of that time limit, that the provision is not misused by the applicant that there are no objections against further usage. However, many foreigners did not know anything about the provision. First of all, a residence permit allows the foreigner to stay for six months in Germany. In this period of time he/she is allowed to search for a job. Favored are qualified workers and persons having already the working permit for a federal territory, whose position was terminated without further employment. In addition to the granting prerequisites, for example the assessment of sufficient means of subsistence, the applicant owners must have a German, another recognized or equivalent degree. Practice has shown, that the recognition of a degree and the assessment of comparability to a German degree regularly causes problems. Therefore, it is recommended to represent yourself by an experienced lawyer during the application process. The represented residence permit is not suitable for every applicant. Especially foreign graduates of German universities, who are not experienced on the labor market, benefit from favorable provisions. A consultation with a lawyer aims to listen to the clients, clarify them about their situation and demonstrate new opportunities.